We love meal bowls! They’re an easy, versatile and nutritious way to think about breakfast, lunch or dinner. Just follow the basic formula of grain + green + protein, and the possible combinations are endless. 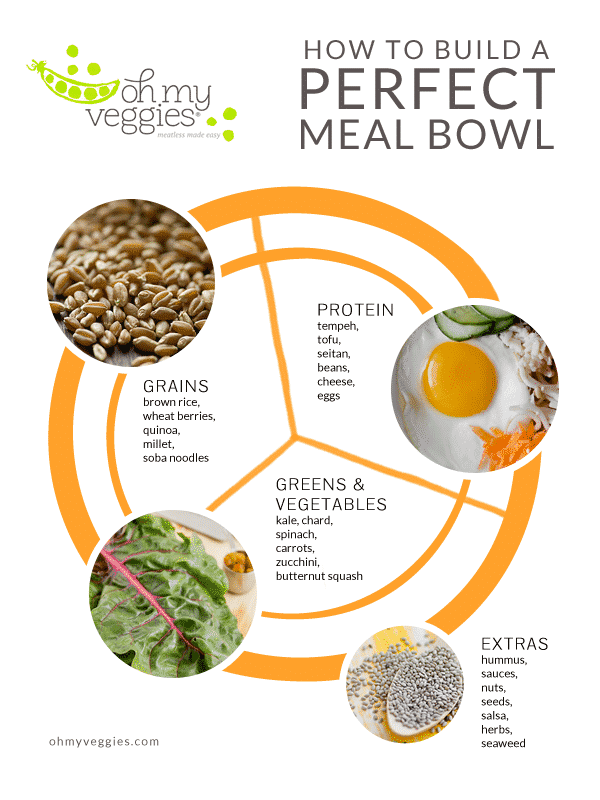 Putting together a meal bowl is easy, and we’ve assembled some tips and inspiration to make it even easier. 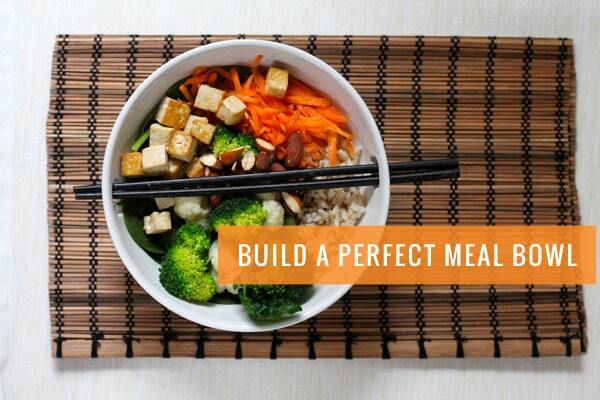 Start building your bowl with a sturdy foundation. Whole grains, seeds, noodles and starchy vegetables are all good choices. The base should make up about a third of your bowl or less. Try whole grains such as brown rice, wheat berries, spelt berries, barley or oats. Seeds such as amaranth, millet and quinoa also work well, and are good choices for grain-free meals. Similarly, starchy root vegetables such as yams, sweet potatoes and parsnips make a great base when roasted, steamed or mashed. If you’re going with noodles, try buckwheat, rice or kelp noodles for something different. They don’t necessarily have to be green, but try to make vegetables at least one-third of your bowl. Leafy greens such as spinach, kale and chard can be quite bulky, so they make for a good middle layer to be topped with other vegetables. Try adding vegetables in various forms: raw, shredded, steamed and stir-fried are all great options. Tip: Sturdier greens like kale will soften up a bit when they are added to a hot grain base. A more delicate green (like arugula) may wilt more than you like, so it might be better added to a cold or room-temperature base. The world is your vegetarian oyster when it comes adding protein – the remaining third of your meal bowl. If you’re keeping it vegan, try baked, stir-fried or roasted tofu, tempeh or seitan. Beans and pulses also work, either whole or whirled into a hummus or dip. Other protein options include cheeses such as feta, halloumi, paneer or cottage cheese. Or you could top your meal bowl with a poached or fried egg. A good dressing can really make your bowl sing. There are so many choices, from hummus and tahini, to salsa and hot sauce, to a salty soy-based sauce. You can also sprinkle your bowl with nuts and seeds, which add both crunch and extra protein. Or, try crumbling fresh herbs or dried seaweed over the top of your bowl for something a little different. Description: This noodle bowl from Oh She Glows gets a protein boost from edamame. It’s dressed in a delicious, savory peanut sauce. Bowl meals are my ultimate lazy dinner! So easy to put together, tasty and satisfying. Great how-to. I pretty much follow the same “guidelines” and agree that a good dressing/sauce is essential! Your Macro Bowl looks delish! I love bowls for lazy dinners as well, but I also think they make great packed lunches. Yum! My favourite bowl is quinoa, baked soy sauce & sriracha tofu, and sauteed greens. SO yummy! Oooh, that sounds great. I love all of those components individually, so it makes sense to throw them all into a bowl together! Meal bowls are new to me. This is why my doctor hasn’t been too happy with me lately. I need to cut back on the red meat and have better sides. This can help. Thanks. I love meal bowls! They can be difficult to wrap your head around though because they are so far outside the standard “meat and potatoes” notion of what a meal should be. You look at it and think “this isn’t dinner” and then you eat it and it’s delicious and you feel amazing. This article is really helpful! I’m pinning the Meze Bowl and the Raw Root Vegetable Bowl to try later. Thanks! The Meze Bowl is one of my favourites! I guess meal bowls are a far cry from a meat and potatoes meal, but so much more delicious and nourishing. Bowls for the win! I kind of wish every meal could consist of a bowl of some sort! There’s just something about them that is so enticing. I went through a bowl food phase and I think it’s safe to say I’m still in that phase. It’s the best when all the food gets combined! Thanks for including my quinoa salad bowl! !